If you want your brain to stay sharp, you have to work it. "I write complex code every day of the week. That's all the brain exercise I need." you say. But you're wrong. If you want to keep your brain alive, you have to do things your brain doesn't expect. The cortex forms new patterns... new synaptic connections in response to novel activity, and PET scans show that far fewer pathways are activated when the brain processes a routine task... even a complex one. 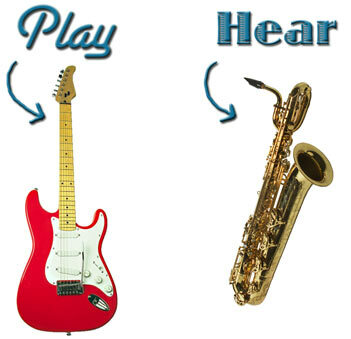 Imagine playing an electric guitar, for example, but hearing a saxaphone. That's what you get with a synth guitar (click on the video button to see and hear the guitar player). At the Telluride Bluegrass Festival, the Sam Bush band was playing a vintage rock song, complete with a vintage rock organ. But... no keyboard player. Then I realized it was one of the guitar players, on a synth guitar. The cognitive disconnect between watching someone play the guitar but hearing an absolutely real smokey sax is... mind blowing. (FYI musicians, Roland and others have done a LOT of work on the latency, and the latest generations of guitar synth/midi pickups is pretty damn good now.) Apparently playing a synth guitar is even stranger than watching/hearing someone else. I play a midi keyboard, so this shouldn't have been so surprising, but we expect keyboard synthesizers, so watching someone play a piano that sounds like a violin doesn't tweak neurons the same way anymore. So what else can you do? The point is to do something different. If you're into extreme sports, try a meditation retreat. If you're someone who is not deaf, you might try attending a silent weekend, a total immersion "sign language jam" intended to give non-deaf people a brain-changing (and some say life-changing) experience. I've had friends attend one of these (they hold them in lots of different places) after taking some sign-language classes just for the unique experience--not because they needed to learn sign-language. They said it's extremely challenging... and very, very rewarding. Or try Dark Dining, by visiting a restaurant virtually blind. They're popping up everywhere--London, Germany, Australia, and Switzerland, and Paris (google on "dining in the dark"). Or let's say you already tend toward being the quiet, chess-is-my-sport type. Then maybe you need something adventurous like, say, trek through Patagonia. "Turn pictures of your family, your deskclock, or an illustrated calendar upside down. Your brain is quite literally of two minds when it comes to processing visual information. The analytical "verbal" part of your brain (sometimes called "the left brain") tries to label on object after just a brief glance: "table", "chair", "child". The "right brain", in contrast, perceives spatial realtionships and uses nonverbal cues. When you look at a familiar picture right side up, your left brain quickly labels it an diverts your attention to other things. When the picture is upside down, the quick labeling strategy doesn't work--and your right-brain networks kick in, trying to interpret the shapes, colrs, and relationships of a puzzling picture." "Place different-color geletain filters over your desk lamp. Colors evoke strong emotional associations that can create completely different feelings about ordinary objects and events. In addition, the occasionally odd effects of color (a purple styrofoam coffee cup) jars your brain's expectations and lights up more blips on your attentional "radar screen." But the book has more than 80 others -- including some more ambitious activities to help blow your own mind. I tend to think that I'm doing a good job on this because I have a good mix of activities... programming, skateboarding, writing, reading weird science, skiing. But then I realized, these things aren't unique for me... they don't blow my mind (except for the weird science stuff). I've been doing them for a long time, so they don't tweak my brain. There's a lot of good stuff there, but no Whoa/WTF experience. I need to keep incorporating new things at every scale--from big macro things like adventure vacations to where I keep my paper clips. So what are you doing to blow your own mind on a regular basis? » Six For Wednesday from MackelWhat? I recently engaged in a little mini blow-your-mind exercise: I went to the eye doctor for a regular checkup and he told me that I have anisometropic amblyopia - he was the first eye doctor to actually give my condition a name - which basically means that when I was young, my right eye didn't develop as it should and my brain quickly determined that my left eye should be the one doing the work. Unfortunately, it's hard condition to catch, but if you can catch it before the age of 5-7, it's sometimes correctable with an eye patch over the "good eye". Too late now. My whole life I've known that my left eye (fortunately) is 20/20 and my right is hopeless. So I use my left eye. Various eye doctors have mmm'd and hmmm'd about it... One eye doctor gave me glasses once, and they were a miserable failure because they distorted my vision so much that it gave me pounding headaches and I couldn't really see anyway. This new eye doctor decided that my right eye is correctible, and gave me a contact lens to wear. Whoa! All of a sudden my world was 3D. I had no idea how flat my world was until all of a sudden it wasn't anymore. Amazing. The trouble is that 1) I can't really read with the contact lens in. I don't know if it's that my brain can't get used to the whole two-eye thing, or what, but unfortunately, this is a *really* bad time for me to not be able to read; 2) I really *hate* the whole contact lens process because I hate putting anything *near* my eye, much less *in* it. So I've been less than reluctant to really give the contact a shot, yet. So the experiment continues... as I have time to try it. The 3D thing is way cool, but the not being able to read thing isn't. It is definitely a brain twister - as the eye doctor said, when I have this lens in, all of sudden my brain is going to realize that I can, in fact, use my right eye and see with it and that's going to twist it up a bit for a while. I would flip my monitor upside down but when you're dyslexic, you already have enough trouble getting the order correct to begin with, no need to confuse things further. I like the idea of colored filters on lamps. ... I've been working on creating a fully aware Virtual Intelligence which requires mapping most conscious processes into algorithms that are finitely representable and hopefully code able... since I was 12. Does that count? DJ's have long known this affect. When you learn how to DJ and you want to blend two songs together you have to be able to count and match beats of one record to the other which has a very mechanical almost mathematical basis to it. Then after you have them matched you need to work the mixer very artistically so that the next incoming song sounds pleasingly smooth and extends the song that just came before it in an aesthetically interesting way. This is purely an act of hearing and feeling what sounds good. I think if you ask most DJ's they will agree that learning how to DJ is about affecting the mind in a way that opens up a neural pathway between the left and right sides of the brain so that you can simultaneously multitask your hands, your ears, and your mind. Most new DJ's get headaches from the process. After the headaches go away, there you are with a shiny new brain with freeway sized neural pathways ready for loud music, flashing lights, and intense ADD distractions. BTW Jerry Garcia used to play a midi flute back in the days and if you had the chance to figure out what he was doing and where the secret flute player all of a sudden came from the experience was... umm... how do I put this? Very moving. Ever tried ImageStreaming? Ignore the hype about being a creativity tool or enhancing intelligence - the experience of getting this to work can really be mindbending. How can I describe it? Creating your own Virtual Reality within your mind comes closest. I change regularly my computer mouse from hand; sometimes I use the left hand to control the mouse, and sometimes I use the right hand. When I feel comfortable enough, I change. you will love a book called "Drawing with the right side of your brain". just by teaching you a couple of powerful perception tricks that temporarily jam your left brain, you start being able to draw! I like to play Go. It requires an odd set of congitive skills that I'm not even sure how to describe. And music in general is good, because one can always learn a new style by trying to imitate someone else. But this post made me realize that I've been doing the same brain exercises for years now, since I graduated from university. I need to go learn sign language or something. Right after reading this post, I jumped into the car to head down to the office. I turned on the radio, and the first thing I hear is Sheryl Crow singing "A Change Will Do You Good". Learn Braille, an elegant compact code for reading in total darkness. If you can reach the mains plugs down the back of your desk, but can't see them, which do you unplug? Stick braille labels on them. After the alphanumerics and punctuation, grade 2 gives contractions for common words, then there's computer braille, music braille and shorthand. Travel is another good way to do this. Go alone to a foreign city. Big cities where you don't speak the language are best, if you can, but any city will do, The countryside may work, but I find that cities stamped with the activity and energy of as many souls as possible provide the most stimulation. There's a part of quantum physics that says that an observed object is altered by the observer, and I can certainly relate to the veracity of that. I find a very special kind of energy in places that many people have visited and observed over long periods of time. Pack a map if you must but don't use it unless you have to. Don't take a camera or cellphone or anything that will distract you from the moment. Start walking. Go with the flow, left, right, straight ahead, back....and just absorb all the new sights and sounds and sensations. Keep yourself open to what happens around you. Take some public transit, but just get off and on when you feel like it. I've discovered the most amazing things this way. @Shaded - Baths in the dark. Yep. Hot bath, complete darkness, good wine and interesting music. I recommend the continuous B side of David Bowie's "Heroes" (V2 Schneider, etc.). Great stress-breaker. I have to admit that playing the guitar synth is a lot of fun but hard work. What it focuses you to do is try and play the guitar like the instrument you are sounding like, not just a guitar playing playing the same old licks with a different sound. This takes a bit of effort. Some sounds are easier than others. Now I'm in the UK and thinking that Bluegrass with a guitar synth is a big no-no. Though I'd love to see what Alison Krauss and Union Station could make of them (just seeing what Jerry Douglas do on his own would be interesting). In Japan I found these strange and wonderful tub creatures you could put in water, like a jellyfish, that takes little glowsticks inside. Very... trippy. Jason -- I'd like to see what Jerry Douglas could do as well! I haven't heard a decent banjo sound from a snyth yet, but I was still surprised how great the sax sounded. Brain: I think travel should go at the top of the list of non-everyday things we should all do a lot more of. A change of culture is good, and so is a change of *job*. Most of us no longer have a choice in that one, but at least there is a big upside for your perspective/brain. hgs: all great suggestions. I saw a mountain-unicyclist once zipping down a ski run in the summer (Telluride) and here I was having trouble just *walking* down that slope. I still don't see how it was possible. Ivan: I LOVE that book! That's kind of what the game-jam is trying to do as well -- by forcing you to do-don't-think. Tim: I think too many people underestimate the effect DJ'ing has that you described. I have an endless stream of teenagers around the house (mine and all the others that come and go) who are SERIOUSLY into scratching, and have had creative breakthroughs in so many other areas not directly related--from art to animation to filmmaking. That left/right crossover thing is powerful and not easy to get from a lot of activities. It DOES happen with the game of Go (as Scott mentioned) which -- unlike Chess--requires almost continuous switching from local condition "left-brain" (metaphorically speaking) procedural logic to "right-brain" whole-board intuition and pattern matching that's usually way too complex to rely purely on memory. Jens: I haven't had a chance to look at ImageStreaming, but you certainly got my attention on that, so I did go and bookmark the link and I'm going back when I have a little more time to explore. Thanks so much for all these creative ideas. I'm sure y'all have inspired a lot of us to pay more attention to breaking patterns and expectations. Well, here's a couple of bread heads for you! Kind of confirms the old cliché that "Variety is the spice of life". Nice article... but isn't it shifting brainpower rater than gaining it? *Very* interesting advice that I'm happy to have heard. Every once in a while, I'll spend 15-20 minutes doing stuff around the house in the pitch dark (or as pitch as it gets in Suburbia), partly because I'm too lazy to fish for the lights, but mostly because I find it fun. I had no idea that was my brain telling me it wanted fresh meat. You blew my mind. And that was the first entry -- guitar synths! May you blow many a mind in your days as a web page! Hey, what did the donkey say to the orgutan? Orange you glad thay didn't kname you rnj-tang? What's the difference between a blog and a hard place?